Governments nowadays want individuals to be useful to the state. That is why they make all those laws so children belong to the state from birth. Right now we are engaged in battle because we do not want to have that way of life nor become someone who eventually is a slave of the state. They offer a lot, but later you will suffer for it. What do our Youth think about? Here is an article one of those wonderful youth wrote earlier this year (2015), for one of our Freepapers. So she wrote this about one and one-half years after the terrible Raid of September 5, 2013. Are you looking to extend the earth’s time? Try as you might to back time up and coerce this selfish consumer society into ‘saving the planet,’ will you succeed? Or will the careless greed that has gotten our planet into the state it’s in…prevail? How was life meant to be? How should we restore it? Well, as you devote your life to this very admirable quest, I am giving every once of my energy and future, giving up my own thoughts, speculations, and ideas, to bring an end to this evil age. There is only one solution. Few human beings retain enough of the image of God to abide by the natural law inside them. They are the ones who seek after food, clothing and shelter in an honest and honorable way. Providing for their families, they control the greed and evil within them and their children. God will reward every man for his righteous deeds. The one solution, that I live, must transcend that righteousness. It is for the broken, the needy, and all those who are willing to give up their rotten, stinking lives. It is for those who lack the power to fight the selfish and destructive nature within them. Although I grew up in this new and living way, I am without a doubt one of the needy. Having been spared from a lot of the devastation that is bound to accompany self life, I have experienced the ugly fruit of my own selfishness and seen my desperate need. My love has limits. On my own I’m powerless against the forces that have wreaked havoc on this planet. We have a Savior! He died for us and paid for our sins in death. Now we no longer live for ourselves, but to see His kingdom come to this earth. We love Him by obeying all of His commands, and most importantly by loving the nearest one to us. We have been set free to love others, care for others and share our eternal hope with others. You must come and see the witness of His love here on earth. Come, give up your life, be forgiven and we’ll run the race together! One week after the Raid, we posted a video of Chavivah on the Internet. In the Augsberg Allgemeine in the first week of June, 2015, Mr. Beyschlag, director of the Nördlingen District Court, said that he will sue the Twelve Tribes because of the posters two of our teenagers carried in the Stabenfest on May 25. It is hard to understand why because Mr. Beyschlag had nothing to do with these posters. There is nothing mentioning the Nazis or comparing Mr. Beyschlag to Hitler — nothing at all. The issue is not about the Nazis or Mr. Beyschlag. The poster had nothing to do with Mr. Beyschlag, but with the fact that the German government considers children as their own property, even though it is a country that calls itself democratic and supposedly protects human rights. The point is: Who owns the children – the state or the parents? Our children were actually taken in the September 5, 2013 Raid against their will and are now imprisoned already for 20 months in youth welfare institutions and in foster families. These girls think that the German people should know the truth about what the family court and the youth welfare office of Nördlingen Donau-Ries do in the name of child protection.The believe that the German should know about what the family court and the youth welfare office of Nördlingen Donau-Ries do on behalf of minors. The families are not treated individually and it does not proceed in an appropriate manner, if there was actually sufficient suspicion for child endangerment. Instead, all the children were arbitrarily removed their families due to the faith of their parents. This is religious persecution. Most children are now being held for nearly two years without a fair hearing, in which it is determined whether their removal is still necessary. In all cases there is absolutely no sign of any damage: on the day of the raid the doctors found no evidence of child endangerment. Why did they not sent them home to their parents that same day, as it had been promised to the children by the authorities, if they would cooperate? Raid on Klosterzimmern 5 September 2013. We will soon publish the opinion of one of these girls, in which she explains why she did that. Then you can make a judgment yourself. It is not about Mr. Beyschlag, but about the welfare of children. The Twelve Tribes children who are still in state custody against their will, for them there is no doubt, that children still belong to the state. They indeed remain separate from their parents without a fair, speedy procedure. Although the medical officers did not find any evidence of any hazard, injury, or abuse with the children, Mr. Beyschlag claimed the opposite during the press conference on September 5, 2013, to the public. Why did he not told you that there was no evidence of child endangerment? So that is, what the leaflet with the image of Mr. Beyschlag was about, which we handed out. The picture was taken at this press conference. We published nothing untrue or twisted in it. The medical report is in the court files. But to this day, the court has not recognized the truth of it. So it is already proved since the police raid on 5 September 2013, that is from the very beginning of the proceedings. In this flier, nothing is mentioned about the Third Reich. It should only inform the public about the fact that Mr. Beyschlag has concealed the results actually found. By concealing important facts in the press conference, he also put the community in a bad light. He has nowhere mentioned the results of the medical examination, but only spread the unaudited statements of ex-members from a family court process, which is normally not public in order to protect the children and to avoid that those affected have to suffer under false suspicion. Is a fair trial and respect of the command of speedy trial at all possible? The Munich Higher Regional Court confirmed this concern. What happened to the children during that 18 months? The Youth Welfare Office has tried everything to incite the children against their parents, against their faith, and against their way of life, and to control their thinking, and Family Court Nördlingen has allowed this to go on despite countless requests from the parents. When we were at the Jugendamt and were being examined, the people came and were supposed to put us in foster homes (orphanages) and with foster families. That was the moment when my worst nightmare began. Me and my sisters were brought to a home. I was just weeping, and I was helpless. Then the police said, “Tonight, you’ll be back with your parents.” As it got later and the caretaker gave us our rooms and beds, I knew that it was a lie and we’d have to stay here for a while. I didn’t know what to do and that’s how the days went by. On every new day, when evening came, I lay in my bed and wept. Then we were allowed to call my parents but it didn’t really help. I simply wanted to go home to my friends and family. I also counted every day – 1 week, 2 weeks, and so forth. 7 weeks had passed before I was allowed to see my parents again for the first time. They were also allowed to know where we were, but they were only allowed to see us when accompanied by the caretakers and Jugendamt, because they thought otherwise my parents would just take us. I couldn’t understand why Judge Mrs. Roser threw us all into one pot. She didn’t have any evidence that our parents beat us. When we had a hearing at Judge Frau Roser’s court, I had a feeling that she had us prejudged already and didn’t really listen to us. At the Appeals Court, for the first time, I felt like the judge listened and tried to understand us. Every day I endured because I knew that the day would come when we’d go home. I knew that even if they separated us, you could never separate a daughter from her mother or father, even if they can’t be together. My friends and parents encouraged me saying, “If not today, then tomorrow.” That’s how we can endure, is if we encourage one another. I also know that when I am away from my family and my friends won’t ever forget me. They encourage me to hold on and not give up. My parents are always there for me. Some children don’t have parents that care for them the way mine do. And nobody can replace my parents for me. They’ll always be the best parents in the world. I know that they love me and I love them, too. After three months we heard that Besorah was allowed to go home. We were so happy for her but it was very hard to let her go. I would not see my older sister very often any more. It didn’t make sense to us that she was allowed to home just cause she was older. I was always happy when all three of them visited every other Friday. Even though we needed to be accompanied and we were never able to have our private “realm”, it was nice. Like cold water to a thirsty soul. Simply forget everything and enjoy the time as a family that we don’t have very often. You’d felt like you were in prison, never knowing when you could go out and always having to be watched. Everyday I hope that I could go home soon. I will continue to endure, even if I suffer. It strengthens the character. I know that I can make it and it will have an end. I am old enough and know what I want. Nobody can force me to do something I don’t want to do. I hope the people who read this letter will take to heart what I am trying to say. And that they might start listening to the younger ones, because they also have something to say. Read more about the courageous and determined Schott Family. Photo: Dieter Mack from Augsburger Allgemeine from May 12, 2015. 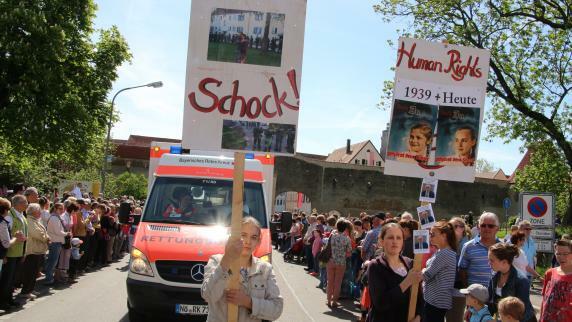 At the “Stabenfest” I carried a sign with the comparison of 1939 and TODAY. I carried this poster with conviction, because what I experience TODAY reminds me on the stories about the persecution of the Jews and the Nazi-time. Of course what we experience today is not exactly the same, but it can be compared, the oppression that ruled back then, is still be felt today. It works a lot more subtle but in some way is just as destructive as back then. You might wonder why I carried and showed a sign at the Stabenfest, on which you could see police and the word “Shock”. On September 5,2013, I was separated from my parents against my will and taken into state custody. Being separated from my parents was a horrible time and I don’t like to think about it. And even worse than that, my sisters are still separated from our family. I want to do everything for them, that they could finally live with their family again. Some of you might have asked yourselves what our situation has in common with the “Stabenfest”, but it does a lot. “Stabenfest” comes from a time when it was normal, when parents trained their children with a rod. Nowadays, these ancient traditions are still allowed to be celebrated but if you practice them, your children are taken away from you. That’s why I want to stand up for this injustice. Our parents always loved us and never abused us. Read more about the Krumbacher family and the Schott family. Why do parents not send their children to school? Could the reason be their love for them? These two young people were forced by the state taking them into care to go for the first time in her life a public school. Previously, each one received home schooling at the private school community. In their own words, our youth describe some of their experiences. The following is the transcript of the German speaking portion of this video. “Then when I went to school in Deiningen it was extremely hard for me to find friends because everyone excluded me. I always tried to be friendly to them and make friends, but it somehow didn’t seem to help anything. “It was totally wild in the classroom, brawling and chairs being thrown through the class room, and….,…it was like hell on earth for me to go to that school. I also got completely discriminated and just not treated normally. For this reason I don’t want to go there any more. I endured it for four months now, but now I have enough. “Besides that I could not learn at all, I couldn’t concentrate when the children turn on their music and cell phone and are totally distracted. The teacher needs to scream across the room all the time because the children are not under control one bit but are totally wild. “And then there are the sixteen/seventeen year old boys that only do nonsense (bosh) all the time and enact kindergarten and I want to learn and can’t concentrate… Also in my interim reference you could see very clearly that I was a good student and that I had a good education in the eight years I went to school in Klosterzimmern. I think until German parents shall be fully responsible for their children’s education, there will be no real freedom in this country. Rights are principally lost through forfeiture. That is, through the failure to exercise your inalienable rights as a human being.2 In regards to education, your rights as a parent to direct and control the education of your children — the children God has given you. Germany takes active measures against those who do not passively forfeit their rights.